“They are playing political games and it is not right”, the South Sudanese Community Association’s Richard Deng told a protest of 400 people in Melbourne in early February. 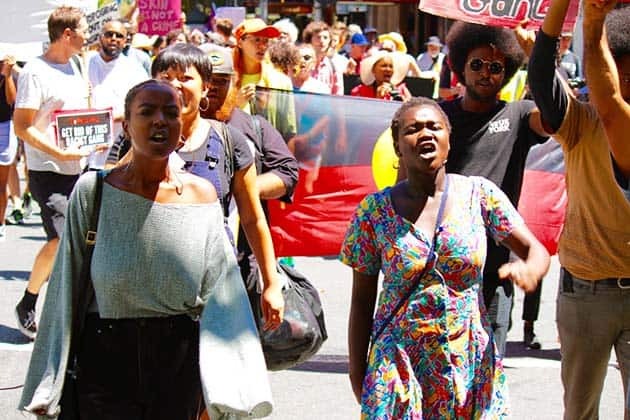 The “Stop criminalising African communities” rally was called in response to the scare campaign around “African Gangs” whipped up by Liberal Party politicians and the Murdoch press through the summer. In January, the Herald Sun newspaper whipped up a scare campaign alleging an “African Gang Crisis”. But it was all a lie. Official statistics released in February show that crime in Victoria is at its lowest for ten years. Youth offences are down over 40 per cent since 2008-09. Even the slight over-representation of young men of Sudanese background is likely the result of racist over-policing of working class migrant communities. Speakers at the rally included lawyers, leaders of community associations, a representative from the Victorian Trades Hall Council and two National Union of Workers (NUW) delegates. The speakers not only rejected Dutton’s comments, but called for an end to the racialising of crime in Victoria, and for the government to better fund public education, housing and employment programs for young people, instead of spending $2 billion on expanding policing in Victoria last year. The Liberals want to use racism and hysteria about crime to score political points before the Victorian state election in November. While Peter Dutton was attacking the Victorian Labor Government for being “soft” on crime, Victorian Liberal Leader Matthew Guy was posturing over tougher mandatory sentencing and increased policing. Labor Premier Daniel Andrews should have rejected the racist attacks on African communities, but instead took the Liberals’ bait, insisting that his government would “throw the book” at young offenders, and reinforcing his call for more anti-terrorism measures. The rally shows the kind of unified fight we will need to push back the scaremongering and expose the Liberals’ agenda of cuts to services. Matt Kunkel from the Victorian Trades Hall Council told the crowd, “the trade union movement will always stand with Melbourne’s migrant communities against these racist attacks. The government attacking you are attacking working people everywhere: they’ve slashed penalty rates, cut education funding and reintroduced the ABCC.